Google has catalogued 900 ailments and pulled together pictures, information and some advice. Search for “pink eye,” and off to the right, you’ll get an information box with a picture, basic facts, symptoms and treatment options. 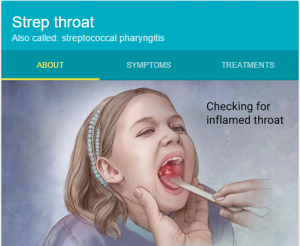 We tried “strep throat” and learned that symptoms include pain in the ear and difficulty swallowing. Under “treatments,” it recommended Tylenol and Advil.